There’s been a lot of reporting recently on a puzzle in particle physics that I haven’t previously written about. There have been two attempts, a preliminary one in 2010 and a more detailed one reported just this month, to measure the size of a proton by studying the properties of an exotic atom, called “muonic hydrogen”. Similar to hydrogen, which consists of a proton orbited by an electron (Figure 1), this atom consists of a proton and a short-lived heavy cousin of the electron, called the muon (Figure 2). A muon, as far as we have ever been able to tell, is just like an electron in all respects except that it is heavier; more precisely, the electromagnetic force and the strong and weak nuclear force treat electrons and muons in exactly the same way. Only the first two of these forces should play a role in atoms (and neither gravity nor any force due to the Higgs field should matter either). So because we have confirmed our understanding of ordinary hydrogen with very high precision, we believe we also understand muonic hydrogen very well also. But something’s amiss. Fig. 2: A muonic hydrogen atom differs from ordinary hydrogen only through the replacement of the electron by its heavier cousin, the muon. The forces holding the atom together are the same, but the larger mass of the muon makes the atom smaller, and more sensitive to the (still relatively tiny) size of the proton. Since the muon is about 200 times heavier than the electron, muonic hydrogen is about 200 times smaller (across) than ordinary hydrogen. [For an argument as to why, see the end of this article.] And so the proton, which has a diameter about 60,000 times smaller than ordinary hydrogen, is only 300 times smaller than muonic hydrogen. That makes the details of muonic hydrogen more sensitive to the proton’s size, and thus allows for a more precise measurement. and no important effects were left out of the calculation. Fig. 3: The energy required to cause a hydrogen atom to transition from one state to another is very sensitive to every ingredient that determines the atom’s properties, including the radius of the proton. (The state of lowest energy is called the “ground” state; all others are called “excited states.) The same technique works for a muonic atom. Specific transitions (not shown) have been used in the case of muonic hydrogen, while many different transitions have been used for ordinary hydrogen. The reason for the recent excitement is that a similar technique for measuring the proton’s size has been used many times for transitions between states of ordinary hydrogen, and it gives a different answer. It is far less precise, but has been done many different ways, so the average of all the different measurements is estimated to be only 10 times less precise than the new measurements in muonic hydrogen. The value for the proton’s size obtained from ordinary hydrogen is about 4% larger than obtained from muonic hydrogen. This is illustrated in Figure 4, which is taken from a recent useful review article on the subject by Pohl, Gilman, Miller and Pachucki. [Note I have abridged their caption.] More specifically, the measurements based on transitions between states of ordinary hydrogen give an average proton radius of about 0.88 fermi (where a “fermi” = femtometer is a quadrillionth of a meter = a thousandth of a millionth of a millionth of a meter = 10-15 meters — and a meter is about 39 inches.) The uncertainty on this result is claimed to be 0.01 fermi. The measurements based on muonic hydrogen transitions give an answer of 0.84 fermi, with a much smaller uncertainty. Precise numbers (valid before the recent improved muon-based result) are given in Figure 4. Fig. 4: Taken from the Pohl et al. review, with a caption abridged by me. 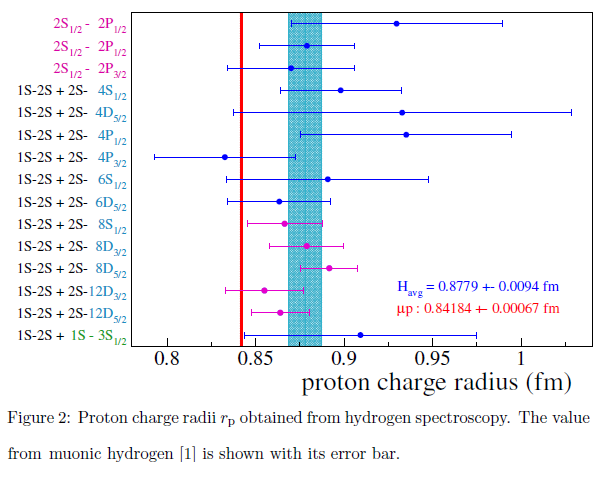 The proton radius is extracted from many different measurements (blue and violet data points) of state transitions in ordinary hydrogen; the blue solid band gives their weighted average, and the orange band gives the 2010 result from muonic hydrogen. All uncertainty bars show one standard deviation. The most recent muonic hydrogen measurement is not shown; the discrepancy is now even more significant. Meanwhile, there’s another strategy for measuring the proton’s size, using high-energy electrons which fly into hydrogen gas and occasionally scatter off the protons deep within the hydrogen atoms (Figure 5.) By looking at the pattern of energies and directions of the scattered electrons, physicists can infer the size of the proton. And the answer they obtain, though again not as precise as obtained from muonic hydrogen, is about as precise and gives about the same answer as that obtained from transitions between states of ordinary hydrogen: 0.88 fermi. This is illustrated in Figure 6, taken from the same recent review article. Fig. 5: The size of a proton may be determined by firing external electrons (whose path is shown by the blue arrow at left) at hydrogen atoms; some of the electrons will strike the proton inside one of the atoms and scatter (path shown by the blue arrow at right). The energy of the electrons is chosen low enough that the proton is not itself greatly distorted or shattered. By studying the probability of and the pattern of scattering, scientists can determine the size of the proton. Well, 7 standard deviations (or “sigmas”) is far more than the 3 to 5 standard deviations that are typically considered impressive. However, one should remember that statistically significant results simply imply discovery of either (a) something about nature or (b) a human error… with the latter always more likely. The famous faster-than-light neutrinos disagreed with Einstein’s prediction by 6 standard deviations, and all that meant was that someone made a mistake. Fig. 6: Taken from the Pohl et al. review, with a caption abridged by me. 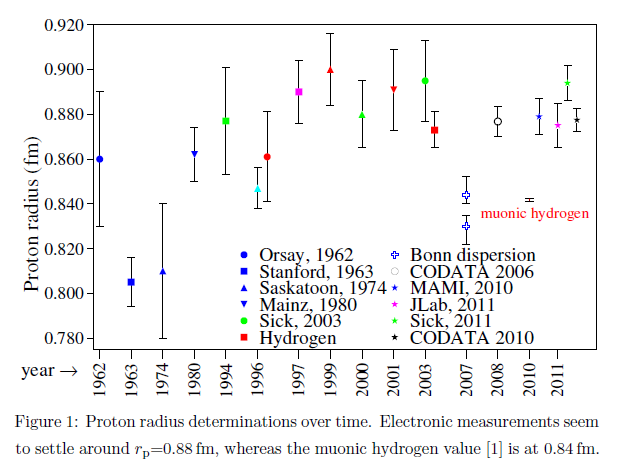 A variety of measurements (and reanalyses thereof) of the proton radius, by year. Most of them were made in hydrogen state transitions and in electron-proton scattering experiments. Almost all recent non-muonic measurements are somewhat above the muonic hydrogen measurement, which lies near the words “muonic hydrogen” and is much more precise than all previous measurements. The most recent muonic hydrogen measurement is not shown, but is consistent with and even more precise than the one shown. Now the most exciting and revolutionary explanation (but, in my current view, very unlikely) for this disagreement would be a new force or other new phenomenon that affects muons and not electrons (or affects exotic small atoms more strongly than ones of ordinary size.) Its presence would foul up the proton size measurement by changing muonic hydrogen slightly, in a way that is not accounted for in the theory calculation that is needed for extracting the proton’s size. But a number of my colleagues have shown, in various ways, that to introduce a new force that would affect muonic hydrogen by this amount, and not muck up previous measurements of the properties of muons or electrons or protons or neutrons, and not show up in the decays of other well-studied particles, is extremely difficult; it requires arranging multiple cancellations between multiple effects, at a level that is highly unpalatable. Maybe I’ll write about this at a later time, but I warn you that you won’t like what you see. You can find relevant references in section 4.5 of the Pohl et al. review. On top of this difficulty, the discrepancy is not (in my personal view) as crisp as it looks at first glance. The calculations required to extract the proton’s size are very complicated indeed, and have many ingredients and steps; the measurements are not very sensitive to the proton’s size, so highly precise measurements and a heck of a lot of theoretical processing are both needed before one can extract the desired information. (In the Pohl et al. review, the authors, merely to summarize the various calculations that are needed and have been performed, require well over a dozen densely written and highly technical pages.) At certain stages along the way, experts might perhaps have been a bit 0verly optimistic about how well their methods work, and if so, perhaps the resulting theoretical uncertainty in one of the proton’s size measurements is underestimated. Given the complexities and subtleties, which lie outside my expertise, the best I can do is warn you that the Pohl et al. review does point out some potential concerns. Here’s a quotation: “To summarize, the apparently simple problem of determining the slope of the form factor at Q2 = 0 [which is needed to extract the proton radius from electron-proton scattering] has numerous potential pitfalls. The weight of the evidence at this point continues to favor a larger radius, about 0.88 fm, but suggests that claiming an uncertainty at the 0.01 fm level is optimistic.” This is not the only issue where questions are raised, though without firm conclusions. It does mean one should remain cautious. A discrepancy of 7 standard deviations sounds like a lot; but if you underestimated an important source of systematic uncertainties by a factor of 2 or 3, your 7 standard deviations could drop to an unimpressive 3.5 or 2 in a big hurry. So a very careful reconsideration of the uncertainties is necessary. Fortunately many additional related measurements (discussed in section 5 of the Pohl et al. review) are being planned, and collectively these should help clarify and perhaps resolve this puzzle. Meanwhile the relevant theorists are clearly working hard to check previous calculations and assure that the limitations on their methods are properly accounted for. At this point I am not optimistic that this discrepancy has a profound origin. But hey — you never really know for certain until the situation is satisfactorily settled — so we’ll need to keep a close eye on this puzzle as it evolves. There’s a very low but non-zero probability that it is of great importance. And if it is, I personally doubt anyone has yet thought of the reason. This entry was posted in Particle Physics, Science News and tagged atoms, muon, proton. Bookmark the permalink. It would be, of course, fun if some new physics were behind the deviation but the room for loose fiber optical cables and hundreds of other possible experimental, theoretical, and interface-between-them problems seems even greater than in the case of “superluminal” neutrinos. I suspect the problems are mainly on the theory side this time. Are you for physics beyond S.M. , or higher proton complexity than was imagined ? Does the later leads to the former ? The latter does not lead to the former. There are aspects of the strong nuclear force that we aren’t able to calculate very well, and that includes the detailed structure of protons. So if the proton is more complicated than naively expected, it’s probably just reflecting the limitations of our methods *within* the Standard Model, not anything beyond the Standard Model. If there’s something beyond the Standard Model afoot here, it is unlikely that it affects the proton’s structure. There are also the possibilities of slightly underestimated uncertainties, missed subtleties, and quirks of obtaining precise results by averaging many imprecise ones. No one of these is probably large enough, but put two or three together and this could all go away. In a black box sense, the notion that proton structure could be relevant seems plausible enough, but imagining the kinds of proton structure issues that may be overlooked (and as a starting point, even understanding the assumptions about proton structure that went into the calculation that was done) is hard to see. What aspects of proton structure could the differering muon and electron calculations be sensitive to? An average quark distance from each of the other quarks that is not roughly equilateral? Some kind of alignment between the lepton rotation and the location of the subquarks with the proton (perhaps the lepton tends to stay between the up quarks and away from the down quark)? The distribution of gluons within the proton? Interference patterns of the constituent quark fields (either QCD or QED)? A preference or absence of preference for a disk-like as opposed to a sphere-like set of quark trajectories? Some sort of chirality effect? Is this a question of different models like the MIT Bag model, the topological model, and the chiral bag model of the proton? Has there been any published analysis of which models or assumptions favor larger or smaller proton radius calculations? There is a more systematic way to approach this question, based on careful mathematical treatment of what it means for an object not to be quite a point particle. Unfortunately I’m not yet expert enough on what’s being done here and what the discussion is all about. If the proton’s structure is important somehow, the smaller muonic atom may be more sensitive to it than the larger and more diffuse ordinary atom. Additionally, and more confusing to think about, the proton structure may have a subtle effect on how the proton’s size is calculated when starting from the measurements of electron-proton scattering. That has to do with fitting curves properly, and is more about mathematical techniques than simple physical pictures. Because all the calculations are very precise and very involved, I don’t think it is possible to have a really intuitive sense of how this is going to work itself out. It’s just not a simple problem that is likely to have a simple, “aha!” kind of resolution. Does one assume that the muon effective size matches the electron size? Or are both leptons treated as identical points compared to the proton size? Or is the lepton size important at all? Lepton size is measured in other experiments; for instance, the magnetic behavior (`magnetic moment’) of electrons and of muons is measured very precisely and agrees perfectly (for electrons) or almost perfectly (for muons) with calculations that assume they are tiny points. High-energy scattering experiments in which electron + anti-electron → muon + anti-muon are very precisely studied and agree, again, with calculations that assume both are pointlike. The decays of muons to a neutrino, an antineutrino and an electron are precisely studied, and yet again agree with calculations that assume both are pointlike. Finally, exotic atoms made from an electron and an anti-muon (where the anti-muon plays the role of the proton) are consistent with both particles being pointlike. In short, the evidence is very strong that both electron and muon are at least 1000 times smaller than a proton. That means that there is no way that the size of either electron or muon could affect ordinary or muonic hydrogen in a measurable way. If you perform the electron-scattering experiment, but with muonic hydrogen gas, which answer do you get? It’s not technically feasible to scatter electrons off of muonic hydrogen, but you would expect to get the same answer: the electron will find the proton looks the same as it does when orbited by a muon as by an electron. You would expect this unless you really believe (which I find so unlikely that I didn’t mention it) that the presence of the muon *really* makes the proton 4% smaller. The reason this is extremely unlikely is that it would require an enormous force between the muon and the proton to make the proton shrink. The proton’s size is set by the very powerful strong nuclear force, so for the muon to somehow “crush” the proton a little bit would require an immense unknown force. It is essentially impossible to imagine how we could have missed something so dramatic. More interesting and more feasible is to do a muon-scattering experiment off ordinary hydrogen gas. Then, if there is anything unusual about the interactions of muons and protons (including, but not limited to, a force that could actually shrink a proton), it will be observed. Also, details of the results can be used to test various hypotheses about what might have gone wrong in one of the theory calculations. 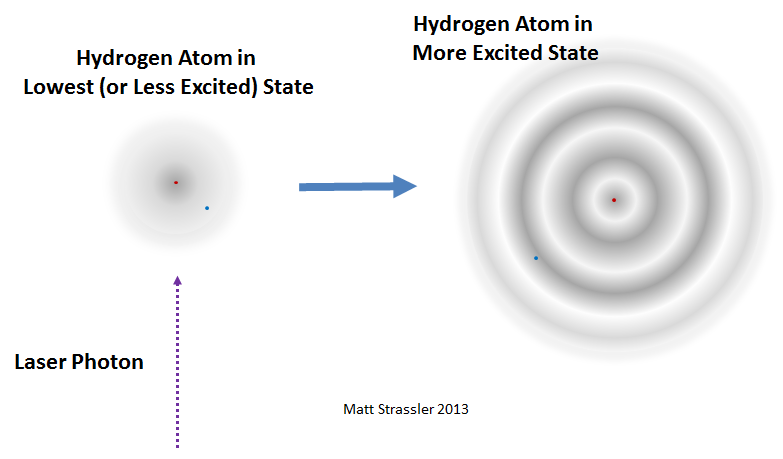 It might be also interesting to attempt electron scattering off ionized hydrogen, i.e. protons “not being disturbed by an electron around them”. But given uncertainity in hydrogen measurements it is a question if this would generate any conclusive results. Well — protons are not much disturbed by the electrons around them. Remember that the hydrogen atom is 100,000 times larger in radius (and 1,000,000,000,000,000 times bigger in volume) than the proton — comparable to the size of the solar system out to the radius of Neptune’s orbit relative to the size of the sun. Meanwhile the electromagnetic force between the proton and electron would be 100 times smaller than the internal forces inside the proton even if the electron was inside the proton. Since the electron is typically 100,000 times further away, the strength of the electromagnetic force of the electron on the proton is typically about 1/100 (1/100,000)^2 = 1/1,000,000,000,000 smaller than the forces internal to the proton. So I don’t think this would be a useful experiment. That answer is driven by the same logic telling us that the proton in muonium should be the same as in hydrogen. Yet it doesn’t seem to be. Anyway – I guess the TOTEM experiment in LHC is already measuring that by proton-proton scattering, I know they already have some results and don’t think they got attention they would if they found anything special. So I guess there’s nothing interesting there. We have no evidence for your last sentence — there is no evidence from the data that the proton in muonic hydrogen is different from the proton in hydrogen. You are making an unjustified assumption. The only evidence we have is that perhaps something about muonic hydrogen (not necessarily the proton) is different from what we expect, and this makes the calculation of the proton’s size, starting from a measurement of something else and depending on a large set of assumptions, give a different answer from what is obtained in ordinary hydrogen. There’s a long chain of assumptions between the measurement of a transition energy in muonic hydrogen and the inference about the proton’s size, and the logic could break down at any stage. For a long list of reasons, the least likely place is that the proton is actually different in the two cases; any effect large enough to make the proton different in the two cases would be so large that it would easily have been observed decades ago. There are many other subtle assumptions that are much harder to check, and it is likely to be one or more of these that is at fault. This is slightly off-topic, but a general question that I’ve always wondered about. In the experiment the photon energy must match the transition energy precisely in order for the photon to cause the transition. That’s just basic QM of course. But surely the experimenters cannot be infinitely precise in their photon generation. So how close do they have to be? Is it truly a delta function? If so, how do they manage such perfect precision? Or is it more of a very steep bell curve, where the probability of a transition drops off steeply with the energy difference, yet isn’t precisely zero? See Figure 3 of the Pohl et al. review, http://arxiv.org/abs/arXiv:1301.0905, and you’ll see the shape of the curve. The curve is relatively wide, but the location of its peak is very well determined. I’m not sure (I’ve neither thought about it nor read carefully about it in the muonic-hydrogen papers) what sets the width of the curve — is it intrinsic to the measuring device, to the measuring technique, or the physics of the muonic atom? that you’ll have to look up I am afraid. I think the width may be related to the Doppler shifts caused by the thermal motion of the atoms. The *natural* line width of any transition is inversely proportional to the lifetime of the state – in this case is would be the natural radiative lifetime for the excited state to relax to the ground state by emitting a photon. All transitions therefore have non-zero linewidths. Because lasers are stimulated emission of photons out of the excited states of atoms the frequencies of lasers also have natural line widths. You simple can’t get a round that. So the experiment involves convolving one Gaussian or pseudo-Gaussian (usually Lorentzian for atomic transitions) with another and measuring the effect as a function of the center-frequency of the changing laser. Of course there are uncertainties. All of measurement science is about understanding and correctly accounting for those uncertainties. Pressure broadening, Doppler broadening, inhomogeneous broadening, etc. All are contributors to the actual observation. I don’t know the details of the muon experiment, but the paper “Improved Measurement of the Hydrogen 1S – 2S Transition Frequency” at arxiv.org shows an amazingly narrow spectral line. The probe laser is phase-locked to a cesium fountain clock. The fractional frequency uncertainty is 4.2e-15. The hydrogen is at 5.8 degK. Are we sure that it impossible to miss that immense unknown force , or it is possible that because it is immense we are unable to see it as its properties are beyond what we know ?…just a possibility. Are our knowledge covers ALL possible forces ? I am making a very simple remark. Big forces have big effects, not small effects. Yes, we would have observed those big effects in a very wide variety of experiments. No, it is impossible to miss a big force because it is too big. No, our knowledge does not cover all possible forces. Yes, our knowledge does cover big forces between muons and quarks or gluons. “Much a Muon Nothing” ? Quite possibly… most discrepancies in physics are just that. The ones that stick are few and far between. Is it correct to think that the stronger interaction of the muon with the higgs may increase the strength of the strong force ? What would happen if we use the tau ? There’s no connection. The strong nuclear force does not affect muons. The Higgs does not directly affect the strong nuclear force. Even though the Higgs interacts more strongly with muons than with electrons, its interaction is still very weak indeed (which is why the muon is still 1000 times lighter than the W and Z particle.) The effect of the Higgs on the muon-proton system can be calculated, and it is vastly too small to have any effect. The lifetime of the muon is only 2 millionths of a second, so muonic atoms almost instantly fall apart, do not have any role to play in ordinary chemistry or the wider universe. This is why the new experiments on muonic hydrogen have only been possible with the most recent technology, operating at nanosecond time scales. In my opinion, a plausible source of error can be the incorrect estimation of proton polarizability in muonic hydrogen, as discussed in the Pohl et al. review. What is appealing about this possibility is that it ties up to a contribution that depends on the fourth power of the lepton mass and it occurs within the bounds of the Standard Model. It certainly is plausible to my eye, though it isn’t clear this effect could be enough to explain, by itself, the discrepancy. So maybe this combined with something else. Could it be a question of refraction? Since the muon could is closer and be be denser that the electron cloud, could the difference in refraction index affect the speeds inside the proton and cause some shrinkage? Some think refraction maybe the fundamental mechanism for rotation and hence give rise to spinors and quantum confinement in general. BTW, what is c anyway? What it the mechanism to puts a limit to the speed of light? Does the energy-time uncertainty principle have anything to do with this constant, i.e. the time in the uncertainty principle is the shortest time interval a quantum state can be maintained without change. So does this time interval between any two states define all and everything? One question about your Fig. 6: what’s going on with the two “Bonn dispersion” points? aren’t they in agreement with the muonic atom measurement? I don’t know; I couldn’t figure it out from the review article and didn’t have time to track down the references. If someone looks this up and learns the answer, please let me know. It’s clearly not a central issue or the review article would have discussed it. Another interesting and thought provoking article. Well done. Energy level(angular momentum) is evident only at excited state(fig 3) ? Can we say, particle nature is evident in excited state and wave nature is evident at less excited state ? Proton’s size could be measured only at excited state ? In the excited state that I drew (and not all excited states look like that), it is not the energy level or the angular momentum which is evident; it is the pattern of crests and troughs in the radial distribution of the waves. The proton’s size (the little red dot) is most easily measured in the differences of energies between states, because it affects those states differently. It is true that an electron’s particle-like nature can become clearer in some highly excited states, while its wave nature must be accounted for in the less excited states. But the excited states where the particle properties of the electron are clearest do not look like the one I drew in Figure 3. They look much more localized, as you would expect a particle to look. Enlightening Professor. Proton respond to momentum transfer rather than differences of energies between states? How is momentum conservation of electron and muon after the external force of laser photon? The calculations required to extract the proton’s size are very complicated. Ratio between the sizes of atom and proton is one of them? Size of the atom is relative with electron muon masses – which blurred between relative and rest mass, due to external forces(momentum transfer)? — in a way that is not accounted for in the theory calculation that is needed for extracting the proton’s size.? 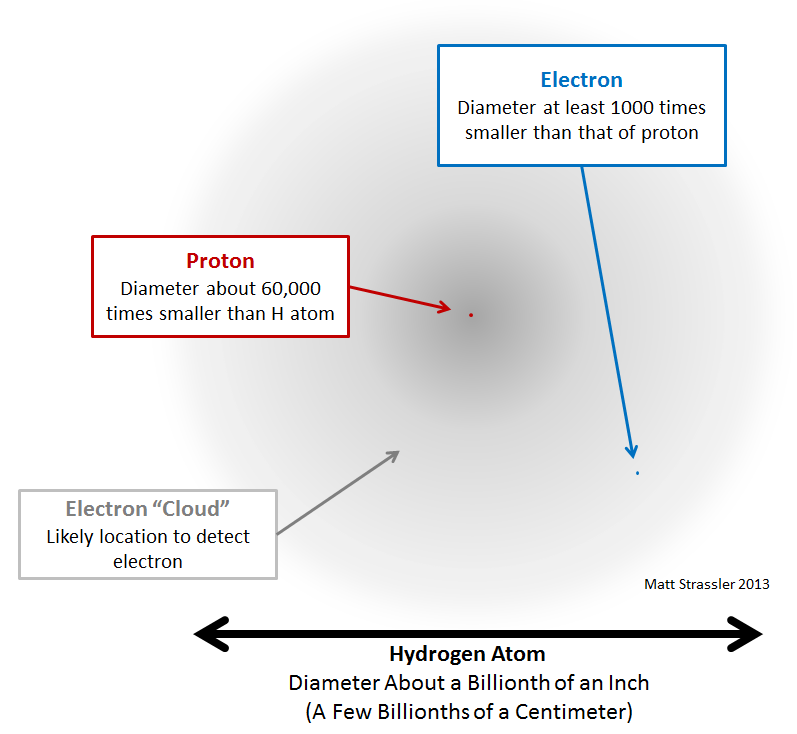 The ratio between the size of an atom and a proton should *not* be a factor in the calculations of the proton’s size, that is one of the assumptions being used. If it is, then we have a problem. You seem very confident that the proton cannot change its size, can you elaborate how the strong interaction leads to the size of the proton? Also I am curious how we know the muon behaves exactly as an electron in the EM force. These are long stories, because we have overlapping chains of evidence. I’ll give you a little bit of the answer, but you should understand there is more evidence than I can fit in one comment. 1) about the proton; the strong nuclear force, like electromagnetism, has a strength that is approximately 1/(distance)^2 at very short distances. But the strong nuclear force stops decreasing with larger distances, and becomes constant. The distance scale around where it becomes constant is about 10^(-15) meters, or one fermi. Quarks and gluons are trapped (or “confined”) into droplet-like blobs by the strength of this force (and if you try to break a droplet apart with lots of energy, you just end up with more droplets, not sub-droplets; see https://profmattstrassler.com/articles-and-posts/particle-physics-basics/the-known-apparently-elementary-particles/jets-the-manifestation-of-quarks-and-gluons/ .) These droplets (which we call “hadrons”) are, because of quantum mechanics, very distinctive; a proton is the lowest-energy state that something containing two up quarks, a down quark, and any number of gluons and quark-antiquark pairs can possibly have, and every proton is exactly the same, with the same mass, charge, spin, and shape. The only way to make a proton change its size would be (a) put a huge amount of energy and “excite” it [something like getting it to vibrate internally] but that requires a minimum of about 300 MeV, or about 1/3 of the proton’s E = mc^2 mass-energy (or “rest-energy”), which is enormous compared to the energies involved in muonic hydrogen, or (b) invent a force that actually is strong enough to push back against the strong force, pushing the quarks and gluons back in toward the center of the proton — but not only would such a force be difficult to write down, it would have to be huge, and would easily show up in other experiments. 2) The muon and electron have been studied together in many experimental contexts, and the equations which describe both of them (the Standard Model of particle physics) is enormously successful in predicting their behavior. The equations (both their success and their internal consistency) depends critically on them having exactly the same charge. More precisely, the theory only works if electric charge is conserved (and indeed every experiment ever done supports this notion.) The process muon –> neutrino + anti-neutrino + electron is regularly observed, and would be impossible if electrons and muons had different electric charge. [I’m using the fact, as we know from all sorts of experiments and observations, that all neutrinos are truly electrically neutral.] An even better check is that the magnetic moment of the muon and of the electron can be calculated, with the assumption that muon and electron have the same electric charge and electric forces, and the calculations agree to many decimal places with experiment. [There is a very small anomaly in the muon magnetic moment, but it’s very tiny; even if you made the electron and muon slightly different to get this anomaly, the effect would be far too small to have any impact on muonic hydrogen.] There are many more arguments but let me stop there. this may be a stupid question.. does the proton have an edge? naively I would expect it to be a fuzzy cloud of quarks just like the electron cloud, or does the different properties of the strong force change this? Not at all a stupid question. When one speaks of the proton’s size, there is a very precise technical definition that physicists universally use. It doesn’t have to do with there being any edge or not. Is the force you are referring to that is not due to the Higgs “particle” actually due to the Higgs field and not the particle? I have never quite understood how a particle imparts a force. Ah — thanks, it is indeed the Higgs field, and to say “Higgs particle” is jargon and not strictly accurate. Sorry, but I forgot to ask perhaps at more relevant question. You stated that the muon and electron are alike in every except the muon in heavier. However you also said that the muon exists for a very short period of time. So isn’t it safe to say that they are not really alike at all since they differ in size and in time of existence? Note that the Professor stats ‘more precisely, the electromagnetic force and the strong and weak nuclear force treat electrons and muons in exactly the same way.’ So the statement is qualified, the electron and muon differ in mass certainly but that doesn’t matter in the situation described here (nor does its half life, which is quite long compared to the timescale of most particle processes.) It’s like the color of the cars involved in an accident, in this case it just doesn’t matter enough to take into account. Thank you for your response it was helpful. However, though the electron and muon are similar (not exactly the same) in the respects you and Prof. Strassler describe, they are also not the same at all in significant ways. So I don’t understand why the need to reconcile the protons size in terms of both the electron and muon. The muon is not equivalent to the electron or interchangeable with the electron so why would we expect some sort of equivalence in terms of their respective effects on the proton? The basic premise of the experiments discussed here is that the muon is not significantly different from the electron in *any way that should affect the results of the experiment. That is, the muon’s mass (and other varying properties) should not affect the dependence of some of the atom’s properties on the proton’s size. The reason muonic hydrogen is used is because it is a more sensitive test of the proton’s size. It is like studying an ant with a magnifying glass and then a microscope. We should see the same result, but the microscope will give far more detailed results. If we could somehow generate tauonic hydrogen and keep it stable long enough, it would be an even better experiment with even higher detail. One stupid question on electron and muon. How muon hydrogen is created, why it decay so quickly? – localised conditions of the nature cannot allow heavy electron? Is muon is anti-positron? Any gauge invariance prevent its quantum mixing with electron at high energy. Energy is proportional to frequency, at high energy, electron and muon fields interaction create “non zero” in a field(Higgs? ), but create more “frequent” soaking(mass) in one field(muon) in high energies? Muonic hydrogen is unstable because the muon is unstable, able to decay into an electron (and other particles.) It is unstable for the same reason that say, an atom containing a strange quark in its nucleus would be unstable, one of its components will quickly decay. Thanka you Mr.Kudzu. In neutrinos, weak interaction reveals the true identity as different flavor (one of the tau-neutrino, muon-neutrino or electron-neutrino) according to the interference pattern at the time of interacting. Neutrinos get their mass term via the same Higgs mechanism. So I thought, this will be same in electron and muon in hydrogen atom. 1. In Fig 1. you show two shades of grey for the “cloud”. Does that mean that both the electron (muon) and the proton have a cloud region associated to each? 2. In Fig 3. you show when a laser photon(s) are “pumped” in to the atom, the electron (valence for heavier gases) increases to a fermi level further away from the nucleus of the proton. You also show that there are more that one (electron) orbits around the proton. Are these inner orbits that of the photons pumped in? If so, the frequency of the photon would play a major roll in how the parameters for both the electron (muon) and proton change. I worked on a sensor used to detect subs. We used caesium gas and as the aircraft passed over the sub, the sub’s magnetic field would cause the valence electron to change its fermi level. We then passed a “light beam” across the caesium gas to monitor any change in the excitation of the gas. Sorry I cannot tell you the frequency of the “light beam”. But I can tell you the all external parameters, light (laser) frequency and bandwidth, ambient temperature of the gas cell, internal pressure of the gas cell and literally every single parameter would have some effect of the “reading”. In other words, as you inferred in you article this process is very very sensitive to external parameters. So, is this 4% basically the minimum steady state error which our present technology “the test setup” can achieve? 3. Again, I ask if maybe refraction has any thing to do with it. My logic is the because the muon is heavier and hence closer, the muon cloud would be denser that the electron cloud. So with respect to the proton it would be “contained” by a different refraction index, causing some shrinkage of its own cloud. 4. This “cloud”, could it be thought as the “tail” of the “point particle” (electron, muon, proton, etc.)? Does it behave similarly to static electricity? Is it the tails of the point particles that create the “charge” and the mass is contained in the “point” (spherical region that defines the particle based on some mechanism we have yet to figure out, like quantum gravity, maybe?)? 5. I don’t see where the extra dimensions (based on string theory) are in this model, do you? I can see gravitons and maybe glueballs, but I cannot see extra dimensions, nor strings. I can see that infinity is not only possible but necessary for confinement, but I cannot see energy flip flopping and vectors changing direction “instantaneously”. I can only see closed loops of spherical shells at various densities. Connection between mass and energy really in nature or only in Einstein’s consciousness? He connected relativity and speed of light…. /Einstein reinvented relativity. In a 1632 treatise, Galileo Galilei set forth what would become the classic version of relativity. He invited you, his reader, to imagine yourself on a dock, observing a ship moving at a steady rate. If someone at the top of the ship’s mast were to drop a rock, where would it land? At the base of the mast? Or some small distance back, corresponding to the distance that the ship had covered while the rock was falling? The intuitive answer is some small distance back. The correct answer is the base of the mast. From the point of view of the sailor who dropped the rock, the rock falls straight down. But for you on the dock, the rock would appear to fall at an angle. Both you and the sailor would have equal claim to being right—the motion of the rock is relative to whoever is observing it. A mirror reflects some quanta of an image and allow some to pass thru. Without probability, if all quantums are reflected(turned around) then it is c^2 ? So linear momentum changes into angular momentum – but in nature it is like the below pic, mass is created only in mathematics, not in reality? Though deducing linear wave equation into angular equation through pythagorean theorem, and pythagorean theorem obey Einstein’s relativity, the change of linear momentum into angular momentum is an mathematical(geometrical) optical illusion like Perpetually Ascending Staircase(Penrose stairs) ? Sorry Professor, if it is too stupid, delete it ! Increasing the energy of the collisions at CERN would indeed allow us to create heavier particles if they exist. It is difficult to say what ‘in nature’ means; is the number 2 in nature? I can have 2 of something, but are numbers just something humans made up? Nevertheless the connection between energy and mass has been tested and found to be very robust as far as scientific theories go. Thank you for the response Mr.Kundzu. My intuition is, the gap inbetween mass and energy is an abyss? It is not the number 2, it is the spin in quantum and macro level ? I am not sure what you mean by a ‘gap’ between mass and energy, they are incredibly easy to interconvert and both nature and we do it regularly. Things like electric charge and spin are completely different and impossible to interconvert. I would almost consider energy and mass to be the same thing. In the rope experiment, if you shake the rope, the energy is carried away as the frequency of the rope wave, frequency is proportional to energy. But the strength, the physical information, quantum action(planck’s constant) is carried away by the Amplitude – it depends upon the property of the rope – this is mass. If wave length(2π radians per quanta?) is infinity, frequency become zero – Mathematically, if the frequency is zero, Amplitude is also zero – but in reality the strength(mass) of rope didn’t change due to the lack of energy ? In quantum mixing or parity, at zero amplitude, due to high speed and quantum level energy, the interaction between two waves( quantum superposition, p = h/2π . k ?) – will create a non zero Resonance(amplitude). So this difference between frequency and resonance, I try to call “gap”. The turn of event or angular momentum cause this vibration ? Here is my theory. In the muon version, the muon orbits a lot closer to the nucleus. Electromagnetic force varies with an inverse square relationship, so this means the quarks and other charged particles in the proton will feel a stronger force from the electron/muon (even though they are in a bound state, they could still feel force, like van der Waals forces). The particles in the proton have a high kinetic energy (“moving fast”). This extra force could result in them being less likely, on average, to venture so far out from their centre of mass , so the proton would take up a bit less space. Every effect that you just described can be (and has been) calculated, and the impact is far too small to give a 3 percent change in the radius of the proton, or to give any other effect in the measurement that would mimic a 3 percent change in the radius of the proton. Geometry seems to be the problem. Not a ball, not a point, but rather a tiny loop, the normals to which are perpendicular to the tiny toroid’s surface and each of which is a velocity potential between the primary loop and some other quantum loop in the entire universe. I doubt it. You do know we smash protons all the time, and have done so for sixty years? It’s not as though we don’t know anything about the proton. We know it is not a point, and we know it is not a loop. I read that when the quarks are released from the proton, like in the collisions at LHC, they are ejected “out” in jets at speed c.
1. If gluons are the bosons that keep the quarks in their respective orbits then is it reasonable to assume that the densities of the gluons are so much higher that the quarks and hence contain the quark orbits by “complete reflection? So, in a sense the spherical space where all this activity in occurring is geometrically defined by refraction and reflection of energies of different densities. Also, if you assume that energy is space-time changing states at speed c, then depending on the space, either quarks or fermions and/or bosons, the mass-energies, i.e. electron of .511 Mev/c2, are the natural, fundamental, frequencies a point, a coordinate system defining that particle, orbiting that particular space-time? i.e. Is everything, including us, just smoke and mirrors? … basically a hologram universe. Are we absolutely sure all protons are at center and the strong nuclear force really exist. What is the role of dark energy in inter atomic space . Our present quantum theory going into those details or we have to develop a new atomic model. How LHC can do some experiments etc etc. These experiments were done a long time ago: in the 1910s, 1920s and 1930s. As for the details of the strong nuclear force, that was checked carefully in the 1970s. No experiment done over the intervening decades has caused any problems. There is no role of dark energy in interatomic space. Dark energy (a constant or near-constant term in Einstein’s equations) only impacts gravity. If that weren’t the case, we would have discovered it long ago. Experiments we have done in the past may now be verified in our more powerful LHC to ascertain that we are not mislead. We are sure now that relativity can not be applied beyond solar system and basically it is a wrong theory in its description and assumptions. . Universe is non isotropic and dark energy and dark matter play a major role in the structure of universe being more than ninety five percent. We are getting more and more doubtful about our old thinking in basic understanding. I’m not sure who you are, but making statements like “We are sure now that relativity can not be applied beyond solar system and basically it is a wrong theory in its description and assumptions.” makes it clear that you are not part of the physics community. On the contrary, relativity works beautifully in describing black holes at the centers of galaxies, gravitational waves emitted by distant pairs of neutron stars orbiting one another, and in gravitational lensing across vast fractions of the universe. So whoever “we” is, it isn’t the scientific community that I belong to. Only gravitational lensing can not be the proof which also can be explained by a better theory I am in the habit of listening scientific community and their doubts. I have raised my own doubts due to my different understanding expressed in many ways during the last decade . Anyway ,who am I but a general public with some knowledge . So take care and carry on. Well if you are a member of the general public, that’s fine; but then why make remarks like “we are sure now that…” when you are in no position to say who is sure about what? You can ask “are we sure that…?” and you’ll get a friendly reception. You can raise any question you want. But making false scientific statements on this website will assure you an unfavorable response. If our universe is non isotropic and the possibility of limiting light speed has been found from experiment and many famous scientific brains doubting applicability of Einstein beyond our zone of solar system and now proton magic indicates a new physics due to two Higgs finding in LHC in CERN, then it is evident that we general public will study relativity and Bohrs atomic model to find flaws and actually it is so happening. Who knows my ether=gravity=dark energy theory of gravitoethertons in balloon inside balloon matter and antimatter universe on opposite entropy path,ever recyclic,rebounce will one day will be proved right. So read my PAPER PUBLISHED IN ASTRONOMY.NET in year 2002 –MISJUDGEMENTS OF NEWTON AND EINSTEIN. You scientific people are bound by relativity theory and perhaps carrier considerations may not allow you to speak but we retired people free from all in search of some reasons and logic. But I accept our limitations and so we must say –are we sure that. I’m sorry, I was right the first time; you are not a member of the general public. You are an arrogant amateur physicist who believes all professionals in the field are idiots, and you’re spouting nonsense. You make irresponsible statements about physics that you do not understand, and you mislead my readers. And so you are not welcome here. further and further towards my legs. It is commonly believed growtaller4idiots that tall people gain more height. they were any longer, but the variety you choose matters. Generally I would not find out report in blogs and forums, even so want to point out that this particular write-up quite motivated everyone to have a look with and also apply it! Your own writing style have been surprised my family.. Does No Hands SEO Work Thank you, very nice article. are you using? Can I get your affiliate lunk to your host? I am grateful of this record of science and physics discussion. Thank you Matt. Matt, the problem is of great importance, and Nassim Haramein predicted it in 2009, based on an extension to Einstein’s and Planck’s theories. Consider the n-body problem, and that analytically, only single proton hydrogen has been solved. N-body problems are more difficult than single body problems. Seeing how you have serious concern about the amount of calculations that need to be done to extract the proton radius form the data, how much more concern do you have about the LHC and their attempts to extract data from a 2 body collision of two protons? I now have SERIOUS concerns about the integrity and accuracy of the Higgs boson work at #CERN #LHC.